At present, HGVs are involved in a disproportionate number of fatal collisions. In 2013 alone, HGVs were involved in 9 out of every 14 incidents leading to cyclist fatalities in the UK. It is important that we are all aware of the dangers of the road and what each of us can be doing to help minimise that risk. The Walking School Bus, bringing together over 70 Southwark schools to ensure the safe journey of a number of young pupils both to and from school. How’s My Driving? provides the funding for high visibility vests and caps for the ‘driver’, ‘conductor’ and children on the scheme. The routes incorporate green space as much as possible and volunteers include parents/carers, staff and child minders. A partnership with Transaid, an international charity, and sponsorship for Claire who cycled 500km through Madagascar to raise money to help fund road safety projects in Africa. 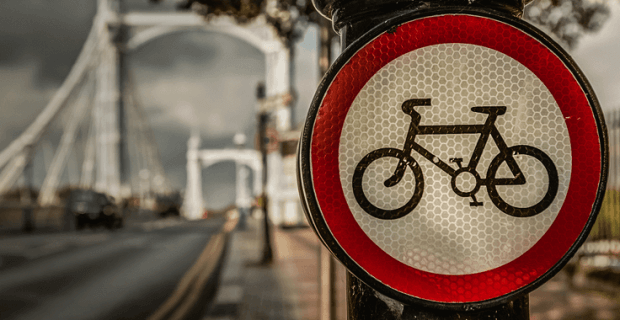 The InTandem Cycle Safety Badge competition, supported by the Freight Transport Association (FTA) inviting road users to design a new hazard badge, in a bid to cut HGV/Cycle collisions. The winning design was put into production and is available for commercial purchase. The idea behind How’s My Driving? is simple. The presence of a highly visible yellow and black sticker on the back of each vehicle helps remind the driver to concentrate on their driving style and, through the user friendly report-back system, allows managers to identify any potential problem areas with individual drivers. How’s My Driving? recognises that all road users have their part to play in the reduction of road accidents. Here are our top tips for cyclists out on the roads around large vehicles. Although the prospect of a new bike is rather exciting, getting in the fast lane at 8am on a Monday morning can be rather daunting. It is a good idea to have a quick practice a couple of days before your first commute to work, to make sure you are comfortable looking over your shoulder whilst cycling, as well as being able to raise your arm to signal when necessary. Remember to check that the bike adjustments are correct for your height and position, your tyres are pumped up and that you have no punctures; if you don’t have one already invest in a mini puncture repair kit, it will become invaluable. Ok, while lyrca isn’t really necessary, it is important that you wear comfortable clothes which you can exercise in. Realistically, with the unpredictable English weather as it is, a lightweight waterproof jacket may be a great little investment to keep in your bag, along with a pair of gloves for those frosty mornings. Obviously a helmet and reflective clothes are both a necessity from a safety point of view. It is also a good idea to visit a professional bike shop who can fit your helmet for you. Lorries, buses, vans and HGVs pose a significant danger to cyclists on the road, mainly due to their size and blind spots. If you can’t see the driver, it’s more than likely that they can’t see you. The advice around HGVs is to ‘stay safe, stay back’ and be particularly wary about overtaking them on their left because that is their blind spot area. If in doubt, always stay back. Make sure you are always at least a door’s width away from any parked car and taxis, just in case they haven’t seen you and open the door. Although it can be tempting to move over further into the left lane so cars can squeeze past, don’t lose that door’s length gap – it could save your life. You are well within your rights, as a road user, to move into the centre of the road in order to prevent unsafe overtaking. Apart from reflective clothing, badges, helmets and ankle/wrist straps, lights are a legal requirement for cycling in the dark and they should also be used when the weather is particularly overcast or raining. Traditionally, the front light should be a steady white light, whilst the back should be an intermittent flashing red light with a reflector on the wheel spoke. Despite all this advice, cycling is meant to be fun, so go out there and enjoy it, stay fit, save money and stay safe!